KUALA LUMPUR: Trinity Corp Bhd is planning further land sale worth at least RM100 mil to RM200 mil in the current financial year ending Jan 31, 2013 as part of efforts to strengthen its financial footing. Chua (left) says Trinity still has 1,229ha in places such as Ampang, Sepang, Puchong, Bukit Jalil and Rawang. Executive director Chua Kim Lan said the group has 1,229.2ha left, mainly in Selangor, comprising commercial, residential and industrial properties. 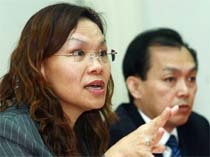 “The pieces of land are at various strategic locations in Ampang, Sepang, Puchong, Bukit Jalil and Rawang,” she told reporters after the company's AGM. In the last financial year, Trinity signed a settlement agreement with the Menteri Besar Selangor Inc (MBI) after shareholders approved on March 30, 2011 to reduce some of its long-standing debts owed to financial firms and creditors following long-delayed projects. Under the agreement, the group, formerly known as Talam Corp Bhd, disposed its properties to MBI totalling RM363.58mil. It also sold 10.352ha in Mukim Petaling for RM39.46mil and 18,582 sq m of commercial land in Kuala Langat for RM52.12mil. For the financial year ended Jan 31, 2012, the group's pre-tax loss fell to RM124.418mil compared with the pre-tax loss of RM153.753mil in the same period last year.However, revenue rose to RM637.424mil from RM183.395mil, mainly contributed by land sale. Its gearing position improved to RM461.72mil from RM726.62mil, down by 36.46%. Chua said Trinity needed more than two years to revert to the black as it was currently undergoing a lot of debt impairment. She said the company would continue to go into joint-venture projects with reputable corporations. “We also plan to develop residential properties on 199.388ha in Berjuntai Bestari in Selangor,” she said, adding that the property would be developed over 10 years from 2016.